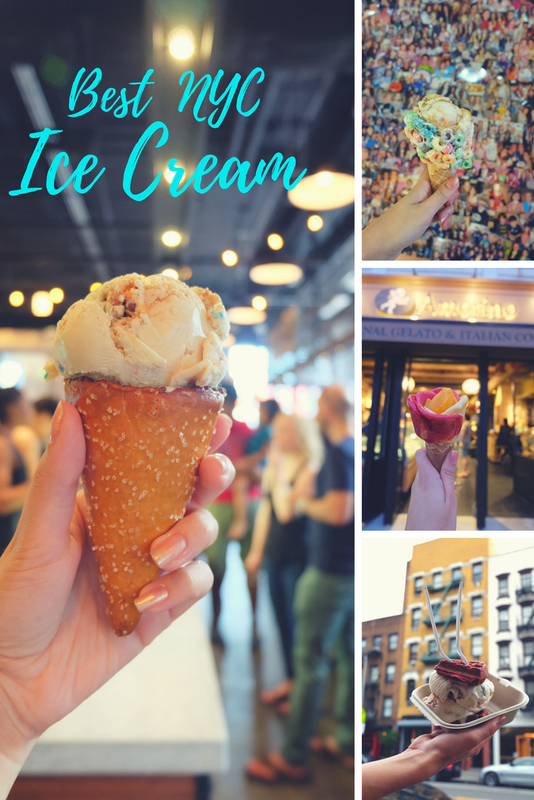 In honor of National Ice Cream day I’m bringing you the scoop on the best places in NYC. A few things you should know are that I have a huge sweet tooth and I am picky about my ice cream. It took me five days, multiple subway rides, lots of napkins, and a few stomach aches to sample multiple flavors, order my favorite and photograph each cup, cone or sundae. What’s on the top of your list, comment below! 1. Ample Hills Creamery: There is nothing in life as satisfying as the “munchies” at Ample Hills Creamery. This salty sweet concoction packs Ritz crackers, potato chips, pretzels and mini M&M’s into pretzel-infused ice cream, and while you’re at it, put it on a pretzel cone. The shop’s namesake quotes Walt Whitman, “I too lived-Brooklyn of Ample Hills, was mine.” If you’re in New York you must visit them in Brooklyn or in Manhattan’s Gotham West Market. 2. Davey’s Ice Cream: Davey rang me up at the cash register and when I complimented him on his ice cream tattoo, he shushed me as I I asked, “are you the Davey?” Davey quit his graphic design job to start this fun and delicious scoop shop in the east village where the ice cream is made behind glass in the back in a 4-day process. Flavors you must try include the beautifully bitter double dark chocolate and the black sesame. 3. Dominique Ansel Kitchen: The line for this seasonal soft-serve is nothing compared to his more popular cronut, but tastes so much better! This is the classic burrata with balsamic caramel swirls, topped with micro basil and there’s even a strawberry confit surprise at the bottom of the cone. 4. Sprinkles: Home of the Cupcake ATM, this is where Upper East Siders can satisfy their sweet tooth on the go. Order the classic “Sprinkles Sundae,” a single scoop of ice cream between cupcake top and bottom or a “Sprinkles Sandwich,” a single scoop of ice cream between two cupcake tops. 5. Van Leeuwen: What started in 2008 as a yellow truck on the streets of NYC, has expanded to include stores in NYC and LA and pints in grocery stores. Their homemade Classic and Vegan ice cream sundaes topped with cocoa nibs are to die for. 6. 10Below: 10Below Ice Cream is one of the only places in New York where you can get Thai-inspired ice cream rolls. This made-to-order ice cream is an experience! When your name is called, you can watch as the cream is poured onto a frosted plate of “10below” and in less than two minutes they sculpt the ice cream chopping ingredients into it, sometimes even drawing a whale out of chocolate sauce! Try the S’mores Galore, the ice cream tastes like it was toasted over a campfire, topped with graham crackers and a roasted marshmallow. It’s located below street level on 10 Mott Street in Chinatown. 7. Brooklyn Ice Cream Factory: This old-fashioned ice cream shop in a 1920s fireboat house has the best views of NYC and the Brooklyn Bridge. They keep it simple with only 8 classic flavors. Try their creamy, not too rich, Vanilla Chocolate Chunk or Chocolate Chocolate Chunk and their gooey Butter Pecan. 8. Chloe’s: This is by far the “coolest” way to eat fruit! This healthy shop in Chelsea is vegan and gluten free, serving soft serve from only three ingredients: fruit, water and organic cane sugar. Every flavor is so refreshing it doesn’t even taste like ice cream! Try a swirled flavor like plum and pineapple on a pretzel cone. 9. Big Gay Ice Cream: Big Gay Ice Cream puts a new spin on soft-serve with fun and playful ice cream flavors and names. The colorful shop in the East Village is unforgettable serving up the classic “Salty Pimp,” which swirls dulce de leche, soft serve and salt (sprinkled from a fancy light up electronic grinder) and it is then dipped in chocolate. 10. Emack & Bolio: Emack & Bolio was started by a music lawyer in Boston in the 70s as a place for musicians to go after gigs to satisfy their munchies. If you can’t choose from the over 100 flavors, try Salted Caramel Chocolate Pretzel. The outrageous cones definitely steal the show and beg to be instagrammed, lined with marshmallow covered Fruit Loops, Oreos, Rice Crispies or Fruity Pebbles! 11. Victory Garden: Victory Garden serves up the only goat-milk soft-serve around. The Turkish-inspired goat-milk ice cream is lower in fat and calories than traditional soft-serve and is lactose-intolerance friendly. Try one of their fun seasonal flavors or the classic salted caramel swirl and chocolate and choose from a long list of unique toppings. 12. OddFellows: When his wife had oddball pregnancy cravings, Mohan collaborated with his friend Sam Mason, the former wd~50 pastry chef, to create locally sourced ice cream in a variety of kooky flavors. They pasteurize their own dairy to make creamy yet scientific concoctions like chorizo caramel, Extra Virgin Olive Oil and Matcha. The flagship store is steps away from Smorgasbourg, on the Williamsburg waterfront, serving 12 rotating flavors and fun banana splits and sundaes and they recently opened an East Village outpost, which serves 8 rotating flavors. 13. Morgenstern’s: Morgenstern said it perfectly, “Morgenstern’s Finest Ice Cream is my chance to express my love of the quintessential American Indulgence. 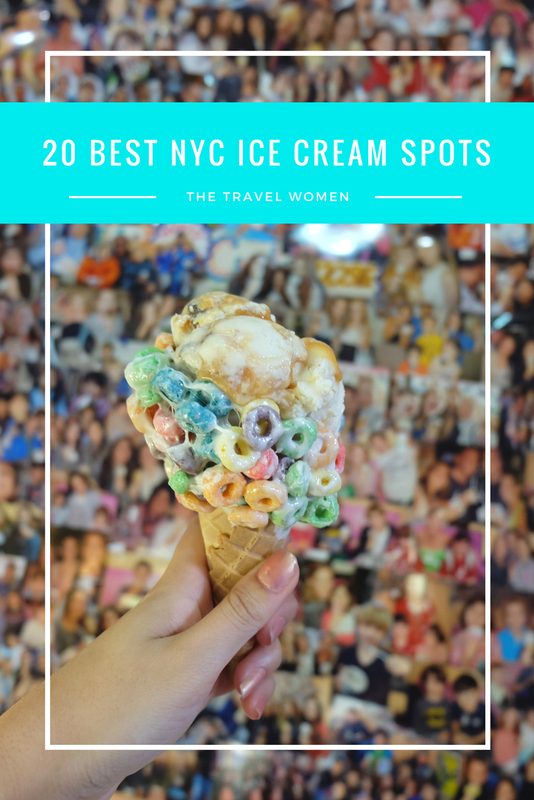 I have been dreaming of these flavors, this style, and this place for years.” Try a huge banana split or get your favorite flavor on a cone, cleverly wrapped around pretzels! 14. Sundaes and Cones: After a 15 year lease in Brooklyn this shop picked up and moved to the East Village serving fun flavors including Asian-inspired ginger, lychee, mango, wasabi and black sesame. 15. Chinatown Ice Cream Factory: One word: Lychee. Add rainbow sprinkles for fun and take a photo in front of the crazy busy neon signs written in English and Chinese. 16. Snowdays: Snowdays wasn’t on my original list but walking past their shop with the line out the door, I had to stop and try some. This light and airy treat is custom shaved to order, inspired by Taiwanese and Korean shaved ices and comes with a spoon that changes color. The Yeti theme makes the “yeti food” flavor a must-try with it’s blue cookies and cream topped with bananas, sugar cone crumbles and the best part: the gooey sweet blueberry puree. 17. Mikey Likes It: Mikey servew simple, subtle flavors without extra colorings or frills. Hands down the best flavor is “southern hospitality” served between two freshly baked red velvet waffles. 18. Momofuku Milk Bar: Next to their must-have “crack pies,” they sell soft serve. Ask to sample the classic “milk,” which tastes a bit tart but is great with cereal or chocolate chips. If that’s too tart try the chocolate chip passion fruit cake soft serve! 19. Amorino: Technically this is gelato, but it’s too yummy to not be on the list. What sets this apart from other gelato places are the fresh flavors with no artificial colors or flavorings and the flower-petal presentation. It’s also one of the few places where even a small cone packs unlimited choices of flavors! BONUS: This new -321 Ice Cream Shop in Williamsburg blasts ice cream in front of you to create these scientific and delicious concoctions. Watch more below. Love this list Jennifer! I’m proud to say that I’ve been to most of these places except for 10below. I totally agree, Ample Hills is also tops on my list too!